Blue crystal in the middle of the above picture is a new addition to my collection of crystals: copper calcium acetate hexahydrate, a compound with formula CuCa(CH3COO)4·6H2O. It is an example of double salts (wiki): salts, having two different anions or cations. For comparison, crystals of pure calcium and copper acetates are put at the sides. Left crystal is calcium acetate (wiki): Ca(CH3COO 2·H2O. The crystals are colorless, their form resembles needles. The specimens on the photo were made accidentally a year or so ago. I've forgot a flask, containing mix of calcium acetate and acetic acid on the shelf. When I opened it, these transparent needles were on the bottom. This crystal have triclinic crystal system. Seemingly black (actually dark blue-green) crystals on the right are copper acetate monohydrate: Cu(CH3COO)2·H2O (wiki). I've grew them half year ago, slowly evaporating saturated solution of copper acetate. This crystal have monoclinic crystal system. And finally, in the middle is the new addition to my collection: double salt, copper-calcium acetate hexahydrate, CuCa(CH3COO)4·6H2O. It has prismatic form, with improper 8-gon at the base. This reflects its structure, which is different from the both pure acetates; it is tetragonal. Alas, the photo can't reproduce the beautiful blue color of this crystal. It is blue with a light violet tint, different from the well known copper sulphate. The crystal was grown rather fast, by the method of cooling supersaturated solution. Because of the fast growth, it is not completely transparent, and bases of the prism have some visible defects. Nevertheless, it's beautiful. Another picture of the same copper-calcium acetate crystal. Copper-calcium acetate grows readily from the supersaturated solution and may be grown by cooling or by evaporation. The key point is to prepare solution that have 4x times more calcium then needed. 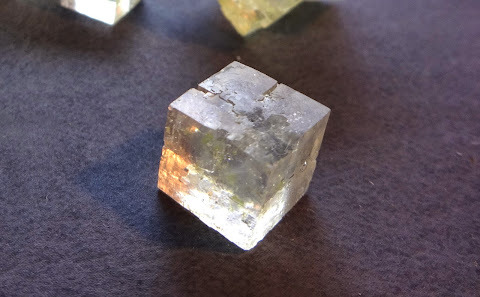 Despite in the crystal there is 1 ion of Ca2+ per each ion of Cu2+, the solution must have around 4 ions of calcium per each ion of copper, or the usual copper acetate will form. I used the proportion: 7.2g of Ca(OAc)2 per 2g of Cu(OAc)2. The chemicals to grow the above crystals can be prepared from widely available compounds: vinegar, chalk and copper sulphate. Copper II acetate Cu(CH3COO)2 is a bit harder to make. I've made it electrochemically, by dissolving copper anode in acetic acid. An easier way would be the following 2-step reaction, starting from copper (II) sulphate (CuSO4, "blue vitriol"). You will obtain blue solution of the copper (II) acetate. Again, carbon dioxide gas would form, so don't add a lot of acid at once. I've made the solution by dissolving dried acetates of copper and calcium in hot water, in proportion 7.2g of calcium acetate per 2g of copper acetate. Though, I believe that exact proportion is not very important here. If the solution was concentrated enough, then after cooling it, light blue crystals of double salt copper-calcium acetate will form spontaneously. If you instead see dark-blue crystals of copper acetate, the, calcium is probably not enough. If you don't have any crystals, then there is too much water, let it evaporate in the warm place. When the crystal stops growing (from several hours to a day), make the solution supersaturated again. To do this, I heated it and dissolved additional salts, then cooled again. Of course, growing crystal must be removed before heating, or it dissolve too. Alternatively, you may grow the crystal by slowly evaporating the solution. It takes more time, but should produce much more clear and well formed crystal. I am planning to do this soon. Note that copper salts are mildly toxic. They won't harm you if you don't try to eat them, but put the chemicals and crystals away from little children and wash your hands (must-have habit for any home chemist). Concentrated acetic acid may be harmful too. Calcium salts are safe.